A party in Ellsworth’s mouth? We’re not quite sure what to make of this behavior from Ellsworth. As we mentioned a couple of weeks ago, the flies are bad here this year, and we’re doing everything we can to fight them. Over the last week or so though, we’ve been finding Ellsworth standing around with his mouth hanging open. Odd. Aside from this strange behavior, it’s business as usual. There have been absolutely no other changes in his routine or behavior. He’s eating fine and plays like he always does. Any ideas out there? 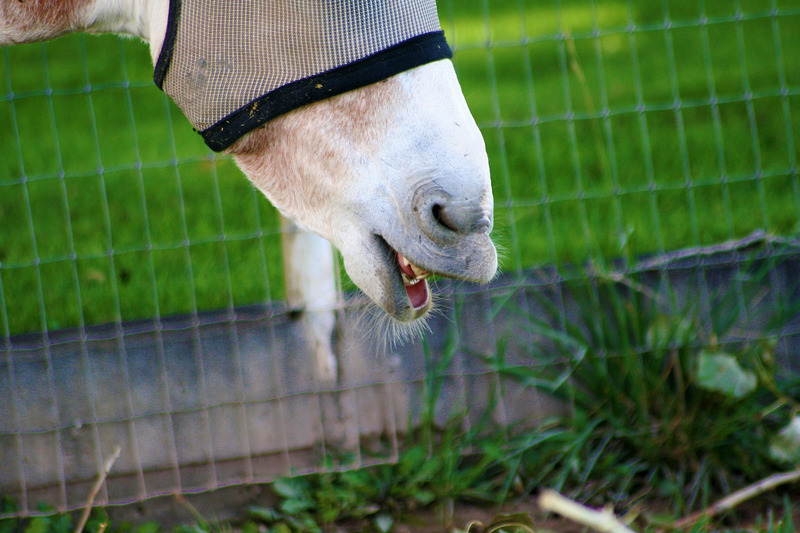 We’re thinking it’s not the flehmen response. Is he just letting the flies have a party in his mouth? Can’t say as I know. Teeth? Bee sting? No idea why he would do this. Hope he’s alright! Hmmm. I wonder if doing that with his mouth scrunches up his nasal passages so the flies don’t go up there?? I’ve been watching him today. As usual, I think you’re right. 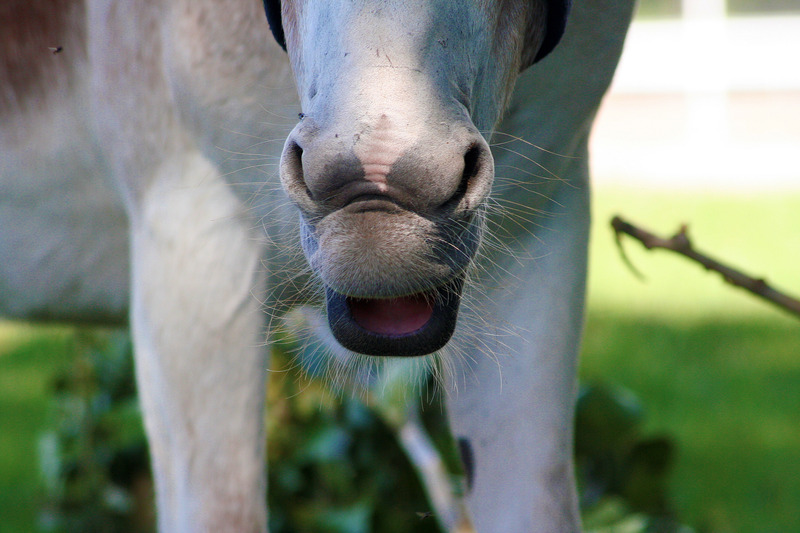 You’re the best, donkey whisperer. I DO love Sam and her person. Love that 8-day pic (ears!!!!!! 🙂 ), love the one of both of them smiling, and then … wow … living happily ever after………. It looks to me like the flies are tickling or biting around his nose and he’s scrunching in response to that. The roll-ons work well around the eyes and on the nose if you’re not opposed to using products. Either that or lightly spray a cloth with fly spray and wipe it on his face. Poor guy! Don’t we HATE the flies!!! You need chickens to keep down the fly population:-)) Better get Hubby busy building a coop. Maybe you should try some natural, organic fly repellent? You could Google it…. I hope he is really ok, though. I had the same thought as Carson; the scrunching closes his nostrils enough to keep the flies from flying straight in. Have you tried the fly predators yet? 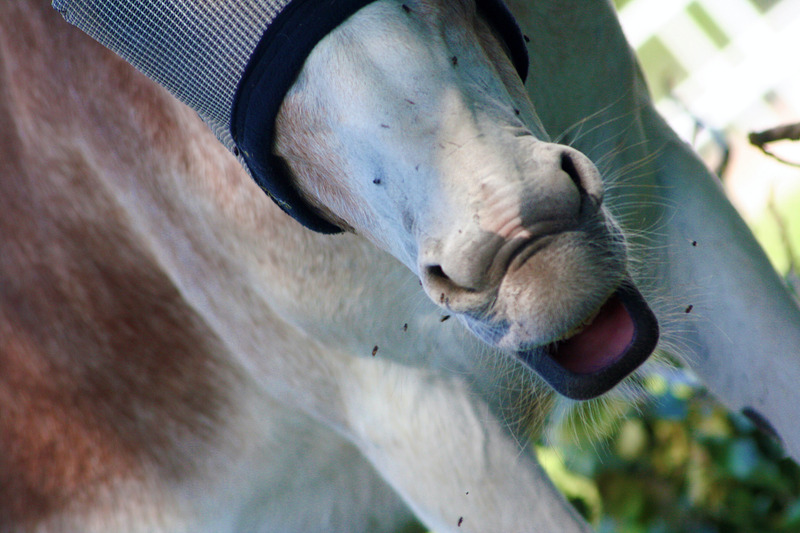 It’s hard to know since we’ve only gotten two shipments, but I think they are working at our place….although, we don’t have near the amount of flies you have with all the equines! Good luck. We did our first application of fly predators last week. We realize that we got started too late, but then we decided it was war and we were going to do everything possible. We’re going to stick with the fly predators, so next year should be much better. I was thinking the same thing Linda was—scrunching that nose closed. The gums aren’t nearly as sensitive to fly bites as the nasal passages. If it’s constant I would worry about some sort of paralysis–allergy, bite, injury caused. Other than that, I like Carson’s guess. As for the flies, by religiously composting my manure (six horses requires a tractor to do so), I have considerably less flies. I’m thinking about adding the fly predators to cut that even more. Thanks. Thankfully, it’s not constant and does appear to only be a reaction to when flies are crawling around his nose. We just started the fly predators last week… even if we started late, we hope they’ll help somewhat this year. I have never seen a donkey do that. Have you checked his teeth lately? If they have any sharp points they could make sores in his mouth. Getting them floated will remedy that. He could also have been bitten by something that he’s allergic to. Or it could be the flies. Don’t you wish he could tell you? We have checked his teeth and found no sharp points. We do wish he could tell us! My first hunch is he is trying to keep the flies away from his nostrils. Does he do that all the time or just when the flies are overy annoying? Roll on fly repellant works great unless you have someone who doesn’t like it. Then it is a cloth sprayed with repellant, then wiped onto the face. Gotta love our critters for keeping us on our toes 24/7!! Guess what I went and bought at lunchtime today? The roll on fly repellant. It definitely appears to be working. Bernard, Ellsworth and Fergus don’t have flies bothering them at the moment… poor Nigel does. From what I read on the roll on instructions, we should only apply it once a week. I wonder if it continues to work all week? I was spraying repellant onto a cloth and then putting it on their faces, which seemed to provide only temporary relief. Nice start for The love Of Donkeys page. 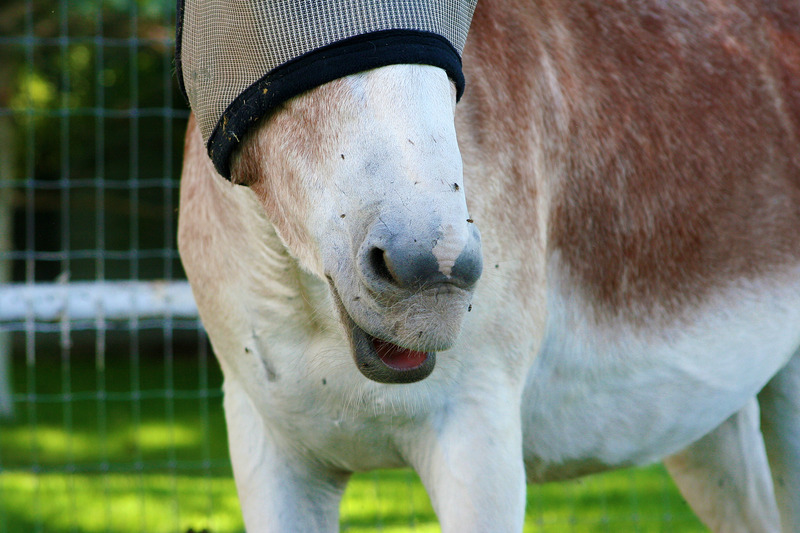 Can you attach some kind of a long fringe onto his fly mask, or would that be just as annoying to him as the flies? Do the flies bite? Poor baby. You know something else I thought of—-you need chickens. Chickens tear apart every single manure pile and eat the maggots of whatever has been laid. It really drops the fly problem according to Joel Salatin at Polyface Farms. As always, thank you for bringing a smile to my face. 🙂 Ellsworth does appear to be talking to himself when he does that. I agree with CeeCee about the chickens! http://www.springtimeinc.com sells a product called Bug Off garlic that is supposed to work wonders for flies. We’ve tried some of their canine products and were satisfied. Check out their website. p.s. Thanks for the tip on springtimeinc.com. Wasn’t there some old saying: Close your mouth before the flies fly in?